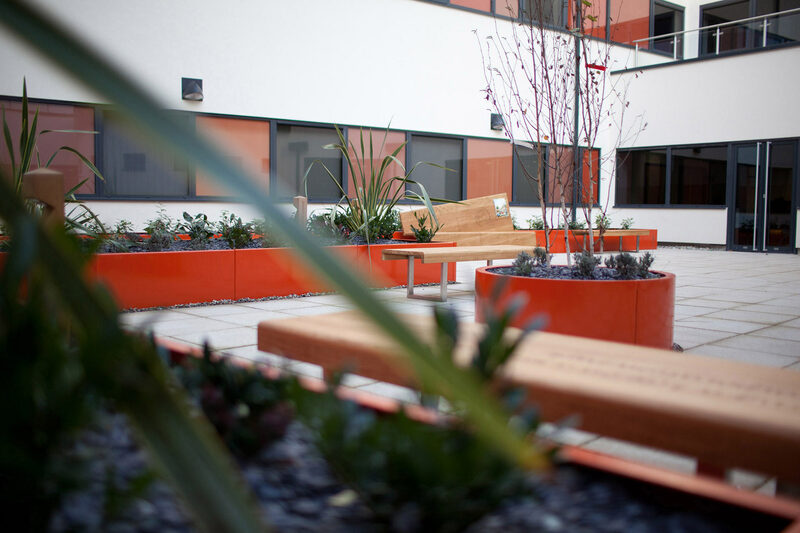 The challege was aimed at enabling young people to come forward for health and other confidential advice, it was important that the new spaces did not feel intimidating or clinical, but rather uplifting and calming. 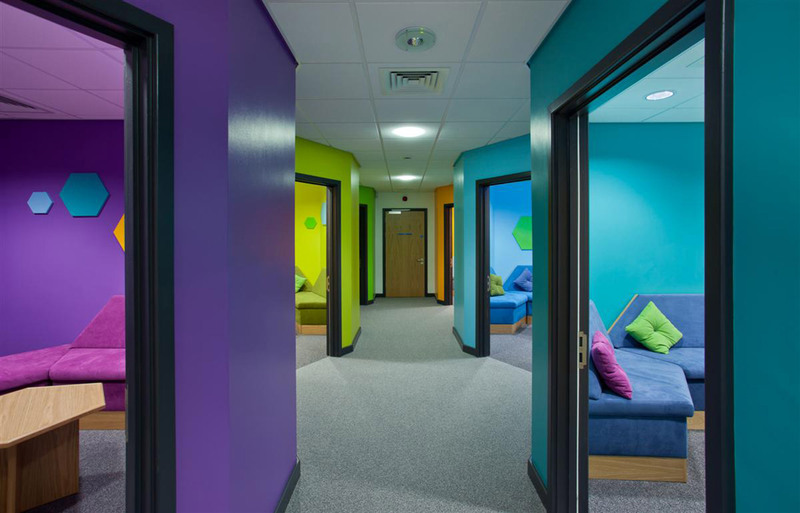 We wanted to get the views of the young people who would be using the facility, to understand their concerns – what would put them off, and what would instill confidence in making use of the centre. 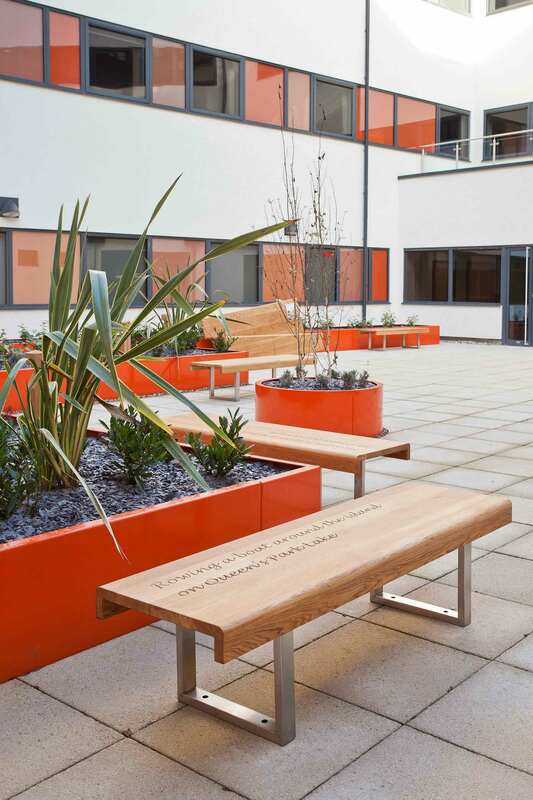 It was also an opportunity to contribute to the ongoing provision of good design in new builds, and to develop strong community support in a ‘first of its kind’ healthcare concept. 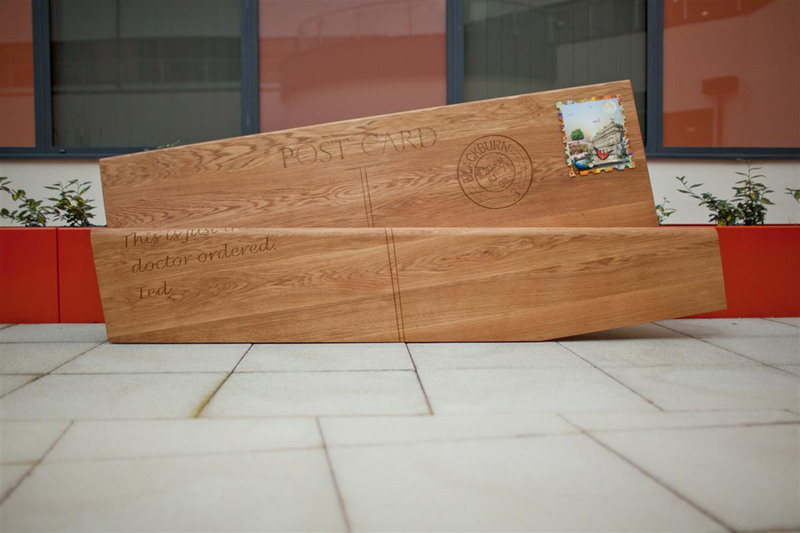 Working closely with Lime Arts, we set up a workshop at Blackburn College where we encouraged young people to express their ideas using cardboard, putty, material and colour. 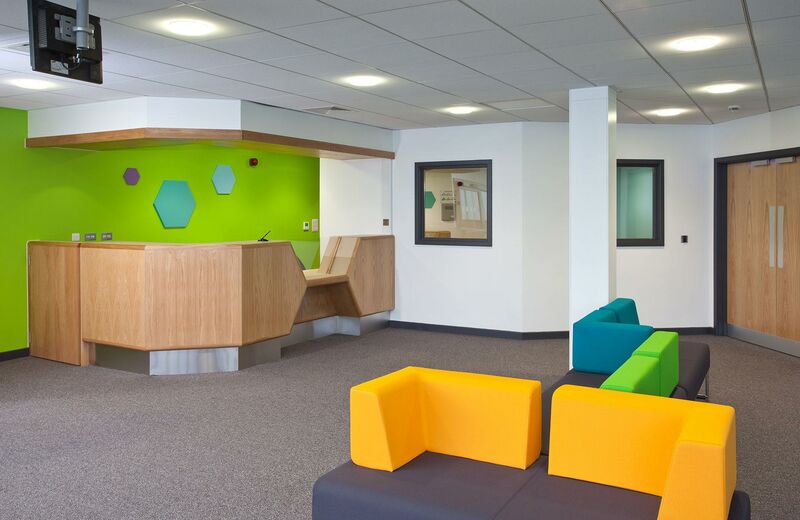 We created a full scale model of the waiting room, allowing the young people to visualise the spaces. 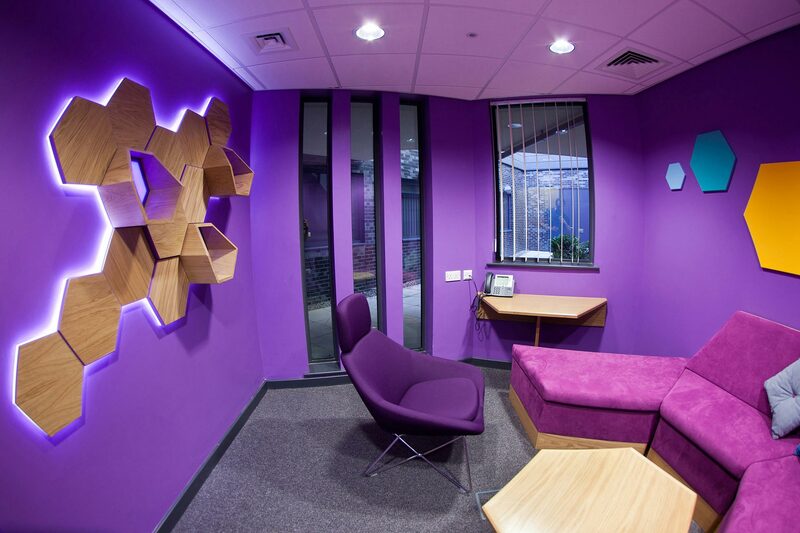 They led the way in colour choices, expressing a preference for deep hues and coming up with the idea of having a different colour theme for each consultation room, so they could choose the colour appropriate to their mood. 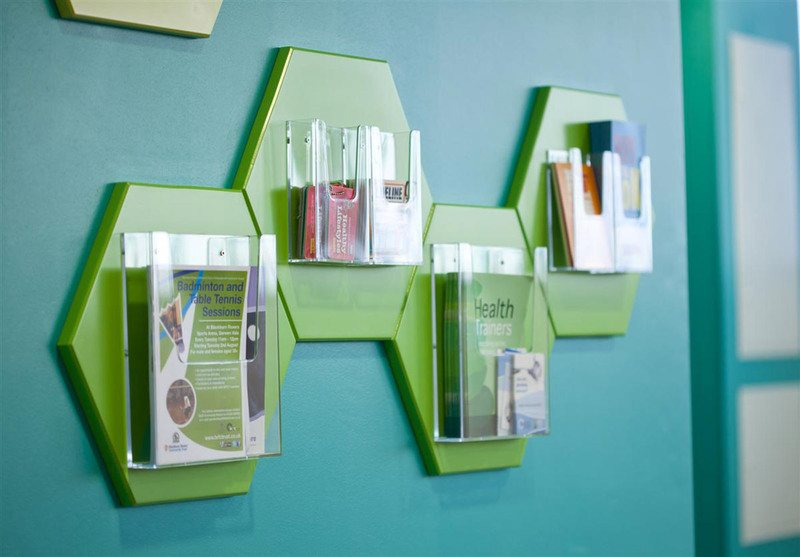 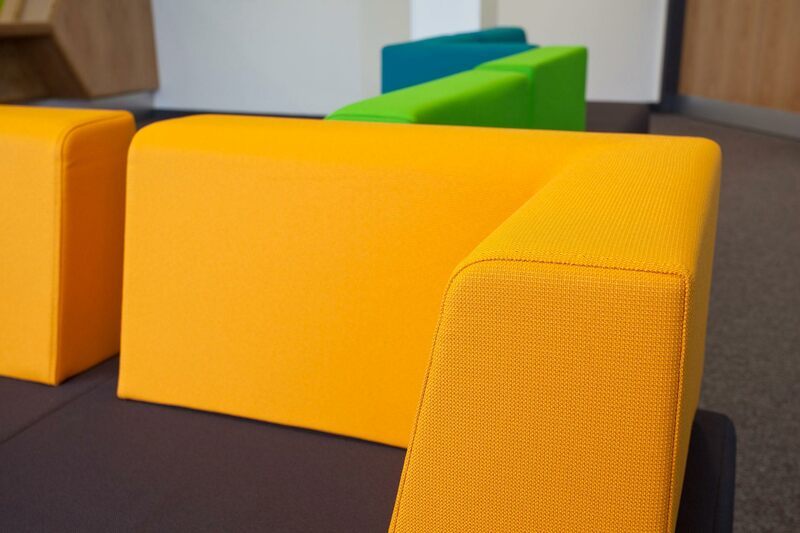 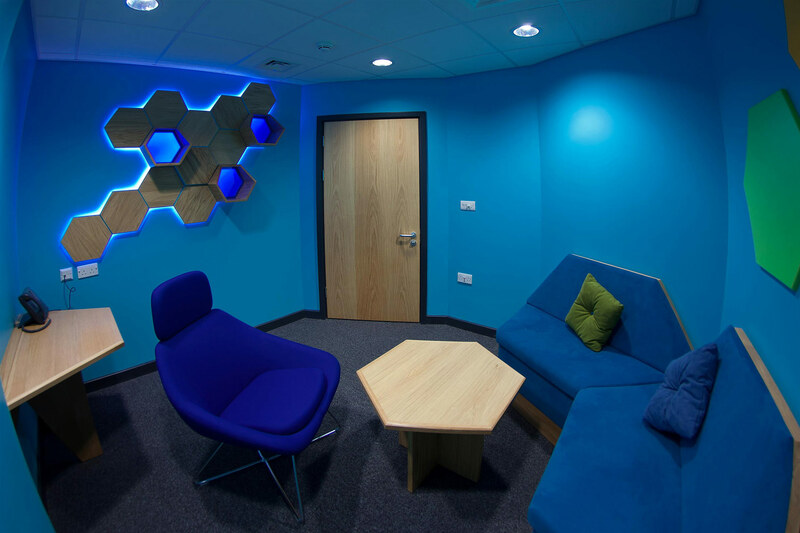 Using a theme of hexagons, we designed the angular shapes of the consultation rooms, and fitted them out with a range of informal seating in the chosen colour. 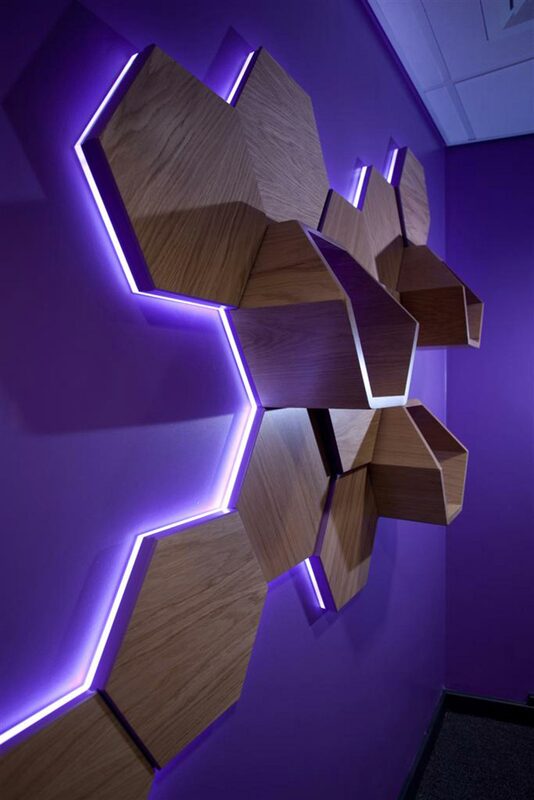 On the walls, gentle LED lighting / shelving features help induce a calming atmosphere. 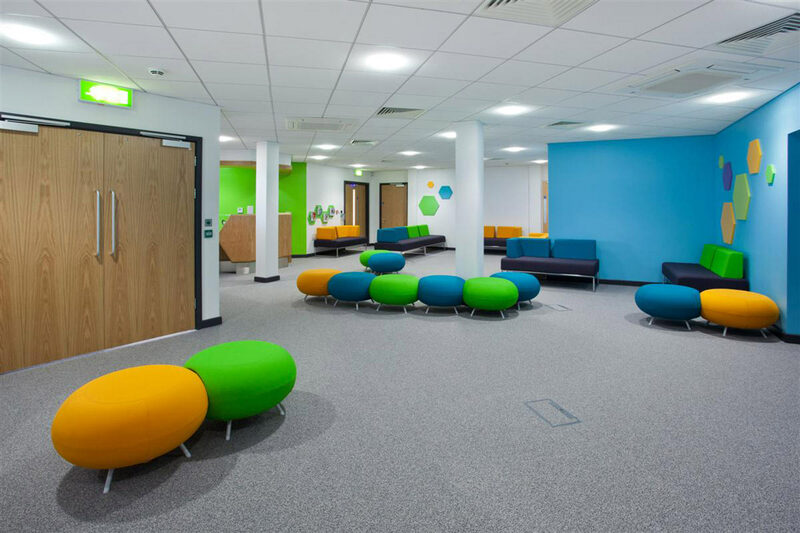 Throughout the area, and working with the architect, we used ground to ceiling windows to make the most of natural light. 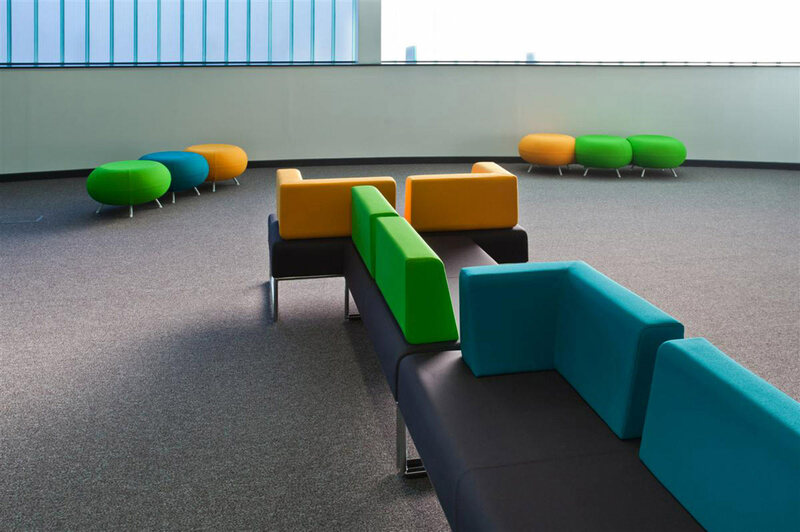 The main reception and waiting / communal area continued the bright colour palette, with groups of informal seating encouraging support and interaction. 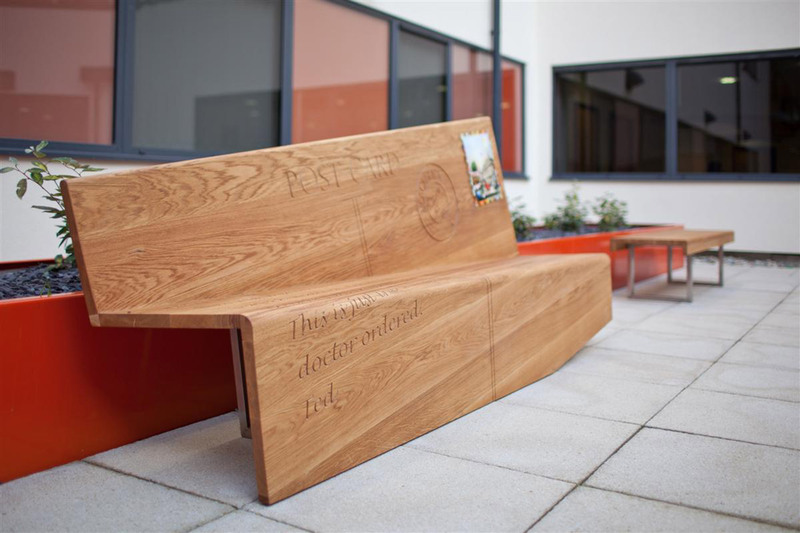 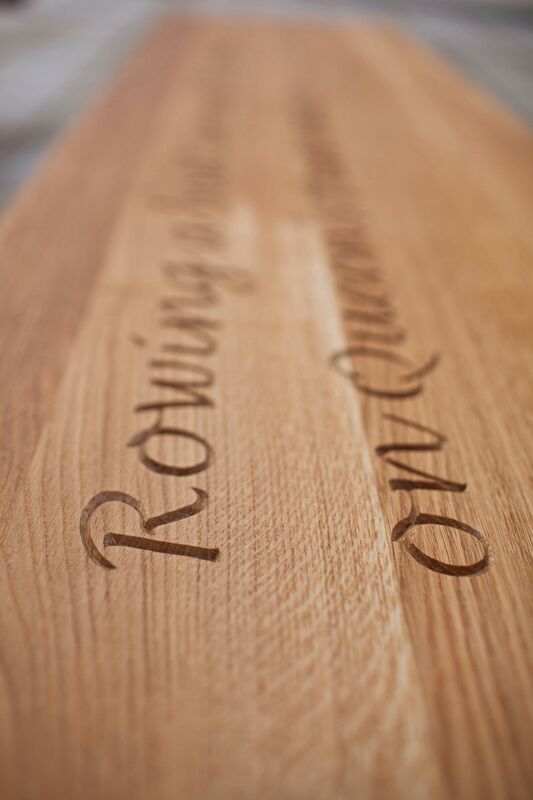 Finally, in the courtyard area, we fitted ‘Letter Benches’ – rolled oak top benches, hand carved with anecdotes about North West locations, tactile and diverting. 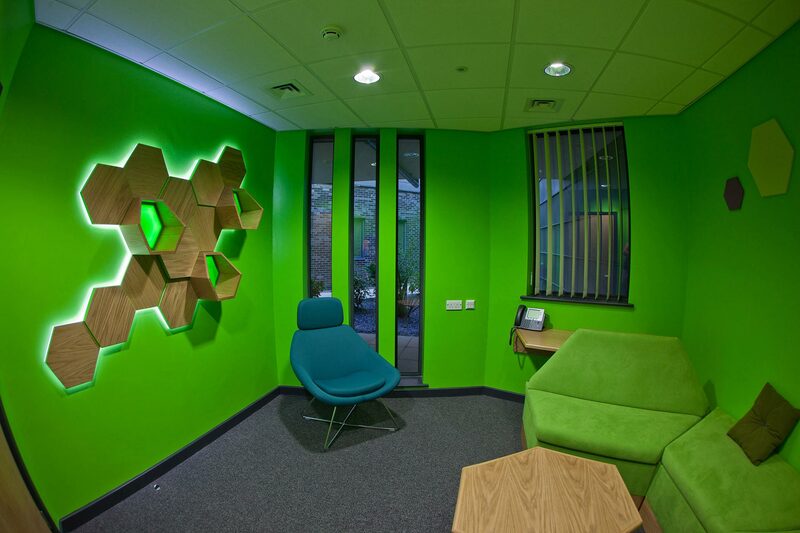 We have created a bright and welcoming space. 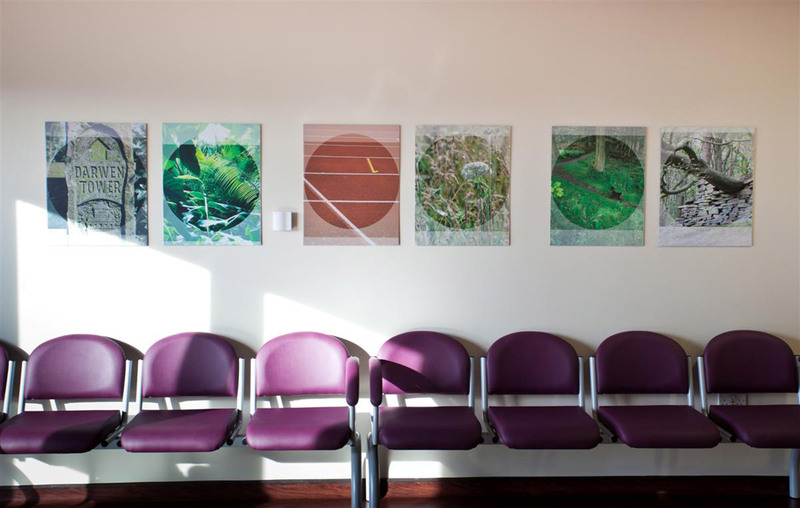 The design process with young people, who showed their preference for bright colour and informal arrangement to help them feel confident about using healthcare services, has helped inform best practice for future arts and health work. 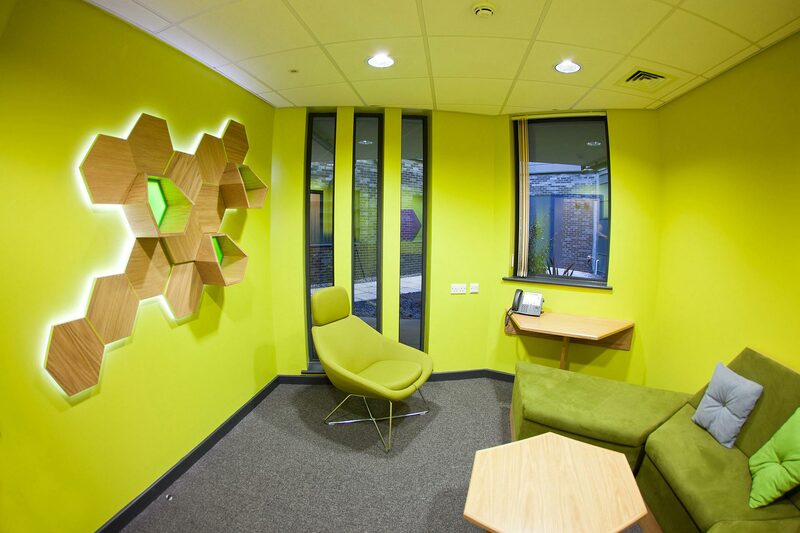 The whole centre continues to be well used, supported by the creative investment that the young community put into it.